Our guide to Portland will help you find the best bed and breakfasts in Portland Oregon. What distinguishes Portland, Oregon, from the rest of America's cityscapes? Or from the rest of the world's urban destinations, for that matter? In a Northwest nutshell: everything. For some, it's the wealth of cultural offerings and never-ending culinary choices; for others, it's Portland's proximity to the ocean and mountains, or simply the beauty of having all these attributes in one place. Strolling through downtown or within one of Portland's numerous neighborhoods, there's an unmistakable vibrancy to this city -- one that is encouraged by clean air, infinite trees, and a diverse blend of historic and modern architecture. There are tons of great bed and breakfasts in the city of Portland, our city guide will help you find the best bed and breakfasts. You may have a hard time deciding what to do in Portland, but we make your decision easy. There are plenty more bed and breakfasts in Portland. 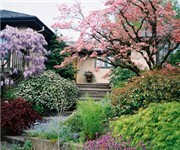 See all bed and breakfasts in Portland Oregon.